Or SEED butters – whatever is smooth and creamy! In only a slightly preferential order, here they are. Links provided for information – you can obviously find most of these in your grocery stores! 10) Trader Joe’s Peanut Butter – This is my go-to standard peanuty peanut butter. It’s inexpensive, incredibly drippy and melts into whatever you spread it on. Crunchy for the win!! The ingredients are also very simple: peanuts, salt. It’s a great staple peanut butter, but so are brands like Smucker’s Natural. 9) Artisana Coconut Butter – Check out my post on coconut butter for more information on this guy. It’s pulverized coconut meat and makes a great meltable spread on top of everything from oatmeal to sweet potatoes to cold smoothies to millet. It’s most fun when it’s drippy in the summer – otherwise it requires a little heat to let it loose. If you love coconut, you will love this. 8) Nuttzo Peanut Free – A twist on the original Nuttzo, this one needs a better name. It is indeed peanut free, but why not call it something more exciting like Super Duper Chia Crunch!? The texture of Nuttzo is amazing – sticktotheroofofyourmouth good with little bits of chia seeds and nuts throughout. 6) Biscoff Crunchy – Also in the treat category, Biscoff is not a health food. I repeat!!! This is mashed up cookies in a jar blended with sweet oils and crunchy cookie bits. It’s as divine as frosting and melts into a puddle of sweetness. The texture is unlike no other. Enjoy in moderation! 5) Wild Squirrel Chocolate Coconut – All of Wild Squirrel’s nut and seed butters are really fun. I love the blend of chocolate and coconut the best, but I really like the Vanilla Espresso too! They are best known for their texture – incredibly smooth and suuuuuper drippy. You can drizzle these on anything. 4) Homemade Pumpkin Spice Almond Butter – Shout out to the homemade nut butters. This recipe makes – you guessed it – very drippy almond butter. The pumpkin spices are perfect for fall. Homemade it worth the trouble every now and then, and you can get creative with every flavor profile under the sun. 3) Anything Naturally Nutty, particularly the Cinnamon Vanilla Almond Butter and Cinnamon Vanilla Sunflower Butter – Naturally Nuttys are thick and gritty – quite the opposite of Barney Butter. I like them most on toast and sandwiches or spread onto an apple. They aren’t my favorite in oatmeal because they are so thick, but their flavor is out of this world. The vanilla is like frosting and the thick texture makes them a really satisfying snack. Best served on a spoon! 2) Barney Butter – Super creamy, this one wins the award for “best meltability.” It’s a roasted almond butter, and the roastiness is what makes it unlike no other. The first time I had Barney Butter I didn’t get what all the hype was about – and then I polished off the jar and understood. It’s the roast. Barney Butter will form a puddle in your oatmeal. 1) Trader Joe’s Sunflower Butter (and Sunbutter as a close second) – Nothing compares to the texture and flavor of sunflower butter. It’s hard to put into words what I love so much about it, but the texture is hard to beat and it’s so versatile. It goes well on everything. It spreads, it melts, it pools, drips and drizzles. It’s slightly sweet and slightly roasted. It’s the best all-around nut seed butter there is! Nutty Butters – My friend Sarah here in Cville has started a nut butter business out of a kitchen in Richmond. Her flavor profiles are incredible! Favorites include Lemon Cookie + Gingerbread. Sarah creates two unique flavor each month and you can special order them on her website. Maranatha Crunchy Almond Butter No Stir Crunchy – I love this one because it’s really meltable and the crunchy bites are big nuggets of almond. Big Spoon Roasters – Out of Durham, North Carolina, these are pure, simple blends of different nuts that have a classic flare about them. I loved the peanut almond. Nutty’s Old Fashioned Peanut Butters – A step back in time, I once looooved these. I still do, but they aren’t one to make my staples list. The butterscotch is my favorite – tastes like candy in a jar! Reginald’s – Out of Richmond, they have some incredible flavors. The CashewNilla is the bomb! NaturAlmond – A roasted almond butter recipe from the 1970s that tastes just as modern as the rest. Ingredients are just “roasted almonds + salt.” It’s all about the roast! I am sure I’m missing one – perhaps even a major brand – that I’ve loved throughout the years. When it comes to the nutrition of nut butters, the biggest pro to using them is their protein and healthy fat content. In this regard, they are fairly comparable. So take your pick! Rather than create my own chart, I found this great one that compiles nutrition information for almond, peanut, cashew, sesame and sunflower butters in 2 tablespoon servings. I say take your pick – unless you’re eating them by the bucket load, they’re comparable nutritionally. All brands are not created equal, and the above refers to pure blends. As I’m sure many of you know, the biggest factor when shopping for a nut/seed butter is to avoid partially hydrogenated oils on the label, which are code for trans-fat. Companies are coming out with more and more gourmet kinds of nut butters, and they aren’t all health foods (see the chocolate + Biscoff notes in my list). I don’t always have nutrition in my mind when I’m eating a nut butter – sometimes it’s for my taste buds alone – but my staple nut butters have 3 grams or less of sugar per serving (so 1.5g per tablespoon) and simple ingredient lists. Please add to the list – what undiscovered nut/seed/anything butters are you loving these days? I love the Trader Joes Sunflower Butter. And the cookie butter. But I don’t think I can ever give up on Peter Pan Crunchy. So Biscoff is neither seed nor nut butter? I’m just confused, as it made the top ten of Nut Butters. It’s just a cookie spread? What part of the description Kath gave was so hard to understand? Nice, Lara. No need to be snippy on behalf of Kath. I’m sure she’s capable of reponding to a perfectly reasonable question. Kath, my favorite- and only–nut butter is simply Harris Teeter brand almond butter- 100% almonds. Wonderful! I just bought that almond butter and I can’t stop eating it!!! I guess it’s just a list of favorite spreads. Coconuts aren’t nuts or seeds either. They’re drupes. Never tried coconut butter, but it sounds fun! I wondered the same thing as Eliza – the list is Top Ten Nut (or Seed) Butters…seems like a Cookie Butter (which is obviously neither) should at least be in the Honorable Mentions category instead of the Top Ten…makes it kind of a misleading list. Sure, might be a nit-picky thing to comment on, but after all, this blog is Kath’s job. Accuracy & attention to detail are important when one is making a living off of their writing. Kath, everything on your list sounds amazing! I’m a big fan of Adams Natural Crunchy PB (just peanuts & salt). I’ve never heard of the Nuttzo Peanut Free – can you explain what’s in it? You mentioned Chia seeds – anything else? Thanks! “whatever is smooth and creamy!” <--- that's what I said the list would be : ) Here's the Nuttzo PF ingredient list: Ingredients: Cashews, Almonds, Brazil Nuts, Chia Seeds, Flax Seeds, Hazelnuts, Pumpkin Seeds, Sea Salt. oh thank you. when you said peanut free and then said chia seeds I was picturing a spread of just chia seed paste which didn’t sound that appealing! Thank you for the clarification that actually sounds delightful! Seriously? Unless you’re signing Kath’s paycheck I think it best to keep judgements and condescension to yourself. It’s getting old, this idea that because Kath’s blog is a business that it’s a green light to criticize and demand perfection. Let’s unclench a little and just enjoy it. My absolute favorite is Justin’s Vanilla Almond Butter. They only sell it at Whole Foods (as of right now), but it’s worth a pricey shopping trip to get a jar or some packets. It tastes like frosting! I’m a grad student, and I keep a jar on campus for apple-and-butter snacks during long days. Such a great pick-me-up. The texture is great: not too thick, easily spreadable, but kind of satisfyingly grainy! “Grainy” doesn’t sound appetizing, but wait til you try it. I tried it and loved it… Frosting indeed! The texture wasn’t my favorite though… Maybe better in the summer when it’s hot? The bottom of the jar does get really thick and gritty, with all of the runnier, oilier almond butter on top! I store it on its side and stir, and the texture stays more uniform! I second that! Justin’s Vanilla Almond Butter is my favorite almond butter ever! I’ve never tried coconut butter, and I’m dying to. It’s just so freakin’ expensive! And that Biscoff… Mmm. I could go through a jar in a week! It’s just too good to even be legal. Interesting to see your favorites (though many are familiar from reading your posts!). I especially liked the nutrition info and shopping tips! I am addicted to PB & Company’s White Chocolate Wonderful peanut butter. I love it over steel cut oats! One of these days I’m going to make the 2+ hour drive to Trader Joes so I can try the sunflower butter. You’ve mentioned it so many times that I’m now dying to try it!! I have a SERIOUS addiction to PB & Company’s Cinnamon Raisin Swirl. Highly recommend, Kath! Thanks for the list! I’ve never heard of coconut butter I’ve only heard of coconut oil. (Which sits in my pantry from an overly ambitious shopping trip.) Is there a difference? Also I’m definitley going to check out Nutty Butters that lemon cookie/Gingerbread combo sounds too good to pass up! Yes, it’s meat + oil verses oil alone. I talk about it some in this post: https://www.katheats.com/favorite-foods/all-about-coconut-butter. The butter is awesome! So digging my hand in the Biscoff and licking it off my palm like a cat is probably NOT a good thing? 😉 I LOVE that stuff! When I’m using peanut butter for baking (where natural is going to take away from the texture of the cookie), I use Planters creamy peanut butter. It’s about time they got in the PB game and it tastes awesome! I also love Mighty Maple Peanut Butter but that’s a moderation one too. I love sunflower seed butter and I’ve actually never had the one from TJ’s. I always go with sunbutter brand. I will definitely be getting TJ’s next time I’m there. I’ve also thought about making my own sunbutter…..you’re right no other nutbutter compares! I believe it is exactly the same…the same company makes it for TJs. Great list! If I can share a possible typo…Barney Butter is #2 in images, but 3 in list. Naturally Nutty is the opposite. Naturally Nutty is a local favorite to me because they are based in Michigan. Kath, a great post. Thanks for sharing. It made me crave my jar of Justin’s! Love it. Have you tried their peanut butter cups. Pretty delicious. Thanks for this awesome summary of your top picks, Kath! I haven’t tried Nuttzo or Justin’s chocolate, but now I am even more curious to do so… I definitely agree with your picks of TJ’s Sunflower Butter, Wild Squirrel’s Vanilla Espresso Almond Butter, and traditional salted, crunchy PB (I’ve been loving a brand that uses VA peanuts!). Do you have a price range you try to stay within when buying nut/seed butters? Great post! I love nut butters but can’t have too many around because they are my weakness. If I can add one, it would be from a recipe you posted once on making your own honey nut butter with the trader joes honey roasted peanuts. Wow, so easy to make and so incredibly delicious! My number one is SunButter Organic – love how it’s just 100% sunflower seeds and yet so deliciously smooth and creamy! Oookay, now I’m jealous because I can’t find any of the above-mentioned nut butters around here. Granted, I still have a jar of Speculoos my brother brought home from the Netherlands but other than that we’re clearly missing out. Still a great post in case I’ll ever get to the US (which will hopefully happen – not just for the nut butters)! Oh fun post! I can never get enough nut butter in my life! Several of your favorites are mine as well. For my “standard” peanut butter, I LOVE Adam’s All Natural Crunchy – it’s made by Smuckers and is affordable, has a simple ingredient list, and is rich and creamy. I love Justin’s Vanilla Almond Butter for more of a dessert nut butter – it kind of reminds me of cookie dough! I actually haven’t tried a lot of these, but I’m always a fan of Justin’s! I also just started making my own nut butters with my vitamix, which is really fun! This goes along with the biscoff crunchy in the non healthy category, but have you tried TJ’s cookie butter? I was just wondering your opinion on which one you liked better. Biscoff wins by a long shot! I love this post, Kath! Thanks! I was just having a conversation with a friend about trying to find a better peanut butter than my current Jif (oh those darn trans fats!). I think I want to try Justin’s – I’ve seen that in stores! And I think this cookie butter is worth making. It’s easy and tastes sort of like a sugar cookie (not like Biscoff): http://www.eatliverun.com/sugar-cookie-butter/ I was actually shocked how good it was! I am pretty much in love with this post! We share a love of seed/nut butters! Sunflower butter has become one of my new favorites but a very simple smooth peanut butter I just discovered is Crema. The only ingredient is peanuts and you can find it at Kroger! AMAZINGLY drippy!!! Also comes in crunchy! I like the part you added at the end about Shopping. I feel like that part is just so important…because even if its marked “healthy” it still may have added things that are just not good for you. The less processing the better. Have you tried Maranatha’s Sunflower Seed Butter? I can only get it at one store here in the bay area… and when I make the trip, I buy at least 3 jars so I’m never without. The nutrition stats blow away TJ’s or Sunbutter (no sugar, just a hint of salt)… you have to try it! That’s my favorite too, and it is hard to find! I like it more than sunbutter because there’s not that extra sweetness. I recently made a macadamia nut butter. Because macadamias are naturally oily, it makes the drippiest, most wonderful spread. It’s practically a sauce. It has a very strong flavor so it doesn’t work with everything but I love it in steel cut oats with fresh blueberries. It’s worth the expense for such a decadent treat! As for me, though I’ve tried most of the gourmet brands/flavors I’m declaring myself a traditionalist – Crunchy, unsalted almond butter from either TJS or Whole Foods/365. Both taste identically roasty, crunchy and simple plus they are super inexpensive – $5 – $7 per jar. I like mine thick and nutty – no extra oil for me. I usually just go to the “grind your own” almond butter stop at Whole Foods, but must try Justin’s if it’s better than Nutella which is supposed to be going way up in price (due to a French tax I think). So quick question, J never refrigerates but I always do, which is fine for the fresh nut butter, it doesn’t become a solid. What do you think? Trader Joes has NO but butters right now – I was “forced” to buy some cookie butter!!! I wish nut butters were more common in the UK! It is hard to find much beyond peanut butter and tahini paste (which I don’t particularly care for). I am currently on the hunt for a good sunflower butter recipe – have you got any recommendations? This is the recipe for one of the best nut butters I have ever made – http://ohsheglows.com/2012/11/26/homemade-mocha-nutella-vegan-refined-sugar-free/. You should give it a go! My sister visited Great Harvest in the Summer and brought me back a jar of Naturally Nutty Cinnamon Vanilla AB- I am so obsessed with it- I love the flavor combos! My personal favorite peanut butter is the Whole Foods 365 brand! Just peanuts and salt, and SO GOOD. Have you ever tried the brand Once Again Nut Butters? Their unhulled sesame tahini is surprisingly good not only in savory dishes [hummus, etc], but also on things like yogurt and hot cereal. Their other nut butters are also great, but their tahini is the best I’ve ever had eaten straight from a spoon. The Once Again Sunflower Seed Butter is my absolute favorite! As a sunflower butter lover, you must try it! I don’t go a week without making this… Just had it on top of roasted Tokyo turnips and baby carrots. Omg! I made these protein cookies last night with sunbutter and was staring at them today wondering why they were green. I thought it was the protein powder! Hahaha so random. SUNBUTTER IS THE BEST! My favorite by a long shot is PB & Co Cinnamon Raisin Swirl! Hands down the best nut butter I have ever had… And I have about 10+ jars of nut butters in my pantry at any given time! I am quite embarrassed to admit how may jars of TJ’s sunflower butter I have annihilated. It is still my all time favorite. So creamy, savory and delicious! I am also really digging the Whole Foods brand 365 organic creamy peanut butter. Yum…LOVE this post– several of my favorites are definitely on your list. I just splurged and bought my first jar of Nutzo– so good! I am soooo the opposite. I have eaten Skippy natural peanut butter for years aside from a quick break where I forced myself to eat the natural make your own peanut butter. Love this post, Kath! I am going to keep this bookmarked and when I feel my stash is running a little low, will try one of your recommeded. I’ve tried Barney, Justin’s, Nuttzo, Natrually Nutty over the years in flavors other than the ones you listed and they’re always amazing. And that Artisana Coconut Butter is like no other! And for good, all-around, awesome nut butters that are $$ friendly, TJs is always great. Their SFSButter is my #1 non-peanut butter nut butter (I think) well and of course Cookie Butter….but it’s so hard to choose among friends. Making my own nut butters is usually what I do now but I love the variety of all the high-end commercial nut butters. They’re like delicacies and I love trying them! If you haven’t tried Trader Joe’s Unsalted Crunchy Raw Almond Butter it is dizzying! Oh. My. God. I am obsessed with it. The taste is amazing. Have you tried it? I love Justins- I have the maple almond and chocolate almond sitting on my counter to prove it! I haven’t seen the vanilla in our whole foods yet, I’ll have to ask for it! I just bought Wild Squirrel Honey Pretzel Peanut Butter. It is delicious! AH yes – I should have mentioned them! I loved that CashewNilla too! I love this type of post, Kath! It’s both interesting and informative. (not to mention, who doesn’t love nut/seed butter!) I love seeing your RD credentials at work in your blog! Great post! Sunbutter is always one of my favorites. I’m curious — have you ever tried PB2 (powdered peanut butter)? I’ve been adding it to smoothies and like it for the reduced calorie and fat aspects (it has a great peanut taste too, though I find that when I use it as a spread, I definitely miss the creaminess that traditional nut butters have). What are your RD thoughts on it? Here’s the link to the nutrition info. I love TJ’s plain old Crunchy Almond Butter and Whole Foods’ brand cashew butter. However, I’m really missing TJ’s Cruncy Almond Butter with flaxseed. Anyone heard any news about when they might have it again? Well, it was pretty addictive, so maybe it’s best that it’s gone…! TJ’s sunflower seed butter is definitely my favorite as well! Great list Kath, thanks! I’ve never had sunflower butter before, so I’m definitely picking this up on my next Trader Joe’s run! I dont think I would ever eat it alone, but I really like tahini in lots of different sauces (dressings, hummus, etc). 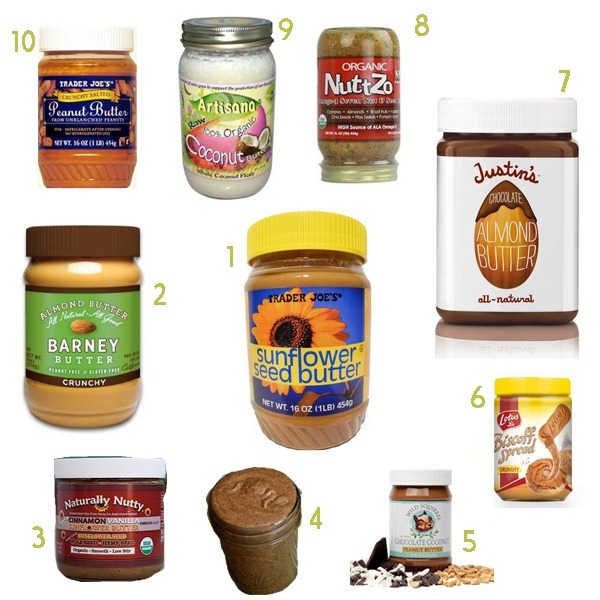 And I agree, TJs sunflower butter is definitely #1! LOOOOOOVE that stuff. This is a great list! I will definitely bookmark it for future reference. 🙂 For the longest time I was a peanut butter purist… until I tried Nutella, Biscoff, and almond butter. There are so many great spreadable options. I am a recent convert to sunbutter! (Thanks to your blog.) I can’t get enough of it in my oatmeal mixed with apples and cinnamon. Mmm. Have you had Whole Foods 365 Crunchy PB? It’s comparable to TJ’s PB in go-to standard, but I think it’s better than TJ’s. Super chunky, drippy and a bit gritty, which I like for the texture. The other one you need to get your hands on is Maranatha’s Sunflower Butter. Super duper drippy and just the right amount of sea salt. Love it! Completely unrelated to this post, but what has been your experience with PVBody since the switch to Ellie? Are you still pleased with the company? Would you recommend? I see on the sidebar that they are a sponsor. Thanks, Kath! So far, so good. I know there has been a lot of confusion, but I got my second order just fine (this week) and have been happy. My contact there Hope is also awesome, but she might be more on the blog side than the customer service side. I’m sorry that some people have had trouble – I think the company picked the wrong time (a transition) to do a lot of blogger outreach! Ellie looks like a really nice collection to me, and I hope to test out the quality and fit. Thanks! Will you be reviewing on the blog? Or on BabyKerf? I love all nut butters but my favorite is the Peanut Butter Co’s Oatmeal Raisin. Holy Yum, it’s like eating an oatmeal cookie but in a spread. So good! I got the Squirrel cococnut a few weeks back and was actually disappointed, didn’t taste much of the coconut at all. I am also notorious for the sunflower butter, it can disappear in no time! Kath, have you ever tried Peanut Butter Co.? They have an interesting variety and they’re based out of New York. Their dark chocolate peanut butter is to die for! You can order them off amazon in 6-packs for a decent price. Justin’s is very good too in my opinion, but it is more expensive and I can’t justify it. My go-to brand is Kettle Almond Butter – creamy or crunchy, depending on my mood! But I’ve been wondering about that PB & Co Cinnamon Raisin Swirl mentioned above. I’ll have to give it a try! I disagree that best = just nut/seed and salt. I would say that best = just nut/seed. Salt masks the flavour of the nut/seed and is unnecessary I think. My favourite in Australia is sanitarium crunchy with nothing else added, just crushed peanuts. So good. I’m planning to try making my own too. I NEED to try all of these! I am mildly obsessed with Barney Butter and TJ’s sunflower seed butter. I still haven’t tried Biscoff spread – I need to get on top of that. Which one’s DON’T have any of “those” oils like palm oil??? All of them in the top 10 but Barney Butter! Justin’s has palm fruit oil, is that the same thing? If you have time I’d love to hear your opinion! I think focusing on plants and whole foods is great, but I think it’s really just another Atkins diet in disguise. I don’t see anything wrong with whole grains, legumes, potatoes, dairy or even the occasional refined carbohydrate or sweet. It seems pretty restrictive to me. I agree very much with Amelia’s thoughts on it. Some good points… And not really about paleo? Most (all?) of the myths in this article support Paleo lifestyle – that we don’t need grains, that eating meat, eggs and healthy fats is ok, etc. Paleo isn’t Atkins at all. I don’t eat 100% Paleo but I love a lot of the Paleo recipes I find. I prefer to avoid grains and dairy. I don’t restrict it all together, but avoid it quite a bit. I still eat fruit and sweet potatoes and am getting lots of carbs. Calling it an Atkins diet in disguise makes me think you haven’t really researched much about Paleo at all. Kath, with all due respect, have you even read, researched on Paleo? You say “I believe it..” Have you read the studies and explanations behind it? Because there is a lot of good evidence. And variations of it. It does allow sweet potatoes. What it does is focus on whole foods…no muffins and sugary spreads and stuff.. I’m not saying its all ‘gods truth’…the truth is that different diets work for different people. Not everybody can eat the whole-grain diet. I know you’ve said before as well that you see no reason to give up grains or whatever because your grandparents ate them and lived long, hearty lives….but agricultural practices have changed drastically since the days of older generations. Hybrid plants, genetic modification, whatever – it’s changed wheat and other foods that’s led to the rise in so many allergies. I really just feel that you give the basic, expected dietitian pyramid response to nutrition at times and don’t dig in or keep an open mind to other dietary theories . Read, research, learn! That doesn’t mean you have to follow those ‘diets’ or lifestyles! (I don’t)… But it does make you more open minded and educated in the research behind it. But perhaps you have no interest in that and are really then more of a ‘foodie’. I don’t mean this badly, I’m just giving food for thought. Thanks. While it doesn’t have Paleo in the title it’s in line with all the principles and addresses common concerns about the lifestyle. “Eat meat [article states why saturated fats, protein and eggs are a-okay], veggies [main carb source. Article addresses lack of nutrients in most grains], nuts &seeds [discusses Cons about low fat diets and different types of fat], some fruit, little starch [discusses how not all cals should come from carbs] and no sugar [not specifically addressed but we all know added sugar is a huge problem in a typical diet].” The no grains thing is also addressed talking about inflammatory properties and sensitivities. Whole 30/Paleo is NOT the same as Atkins. It’s not a low carb thing, it’s a balanced carb thing and forces one to look at where carb sources are coming from. As far as legumes go, they are also thought to be on the inflammatory side and you also have to cook them for HOURS before they are edible, so there’s that to consider as well. Same with dairy (in some). Hope this helps!! It’s all interesting and worth reading up on for sure. Although you will never really know how certain foods affect you unless you cut them out and put them back in. 🙂 ps written from my phone – ignore weird errors ! I pretty much agree with their thoughts except for the no grains thing. Just because some people have trouble with gluten doesn’t mean everyone should avoid it. My GI tract happens to love it, and the nutrients it provides can’t be ignored. Cooking beans for hours doesn’t deter me either! You have to cook a buffalo for hours to make the meat palatable… I agree with you though – you have to find what works for your body. I’m not sure where you are getting your information re: cooking buffalo, but you are misinformed. Bison is prepared exactly like beef. It makes fantastic steaks and burgers. The best thing about bison is that it is leaner than beef, so it is a good alternative if you are watching your fat intake. I’m aware – I love buffalo. I’m just saying the argument that something has to be cooked as a negative isn’t really valid to me. I think the point is that you COULD actually just eat the meat raw (gross sure; possible, yes). But the example is more that one can’t really eat/digest a raw bean unless it’s been cooked – JUST something to think about 🙂 And to add to “J” above – it’s a lifestyle of eating. Will it be the end of the world if you eat a sandwich on whole wheat bread from time to time or a bowl of ice cream (“moderation”)? No! Can you live on a day to day basis without them and be 100% healthy? Absolutely. Oh I see. Sorry that I misunderstood. It was just that you said, “You have to cook a buffalo for hours to make the meat palatable,” so I assumed that you meant that you thought you have to cook a buffalo for hours. I agree with you, though! Taking the time to prepare and cook a nice meal from fresh ingredients (whether fast or slow to prep) is always a good thing! No, buffalo does not take hours to cook to make the meat palatable. I’m not sure why you would say that, to be honest. 🙂 It’s just like beef. I mean from a Paleo caveman hunter’s perspective. I enjoy Buffalo burgers myself. Hi Kath, you mentioned grains have nutrients that can’t be ignored. From an RD perspective, what nutrients do grains have that vegetables or meat do not? Thanks! I think you misunderstood me. I don’t mean they have something magical that doesn’t exist in other foods. Clearly you can live a grain-free life and get all of your essential nutrients. But they provide fiber, vitamins, minerals and sustained energy yet they are often spoken about like they are a nutrient-void food. My body is happy to get those nutrients from grains. Love LOVE love this post, Kath! I have a question. I eat A LOT of PB2 )or peanut butter powder) and nut butters in general. Recently I heard that some peanuts are contaminated with aflatoxins that are potentially dangerous. Have you read anything about this? Is it something to be worried about? I don’t want to rain on anyone’s peanut parade but that stuff just always freaks me out a little bit. That biscoff spread is crazy good. I tried it thanks to a post of yours.I no longer allow myself to buy it. Theres no such thing as moderation when I open that jar. Ive even given the jar to my son and told him under no circumstances give it back to me, doesnt work I make him hand it over. I only buy it a few times a year myself – agreed! Sunflower seed is my all time favorite too! With peanut and almond as second and thirds! great post! I love Trader Joe’s raw unsalted almond butter. mmm! I love Barney Butter too! And I like even better that it’s made in an almond-only facility, since I’m allergic to all other nuts. My other favourite is soy nut butter from The Soy Nut Butter company. It does contain palm oil, but its delicious! And it’s nice to have an alternative that tastes like PB, according to my friends. I love nut butters–especially peanut butter! I like exploring different kinds of nut butters but usually stick to the standard organic peanut butter w/ minimal ingredients! My fav is Trader Joe’s Almond Butter with Roasted Flaxseed! OMG I check for it every week…I miss this stuff desperately!! Great list!! I’m most definitely a nut butter lover too. I REALLY love Peanut Butter & Co’s Dark Chocolate Dreams too it’s SO addicting. I just tried the vanilla espresso wild squirrell in a packet form…. now I need to get a jar of it! SO good! I also just bought a new brand of almond butter called Once Again. I LOVE it! So drippy and delicious and healthy. Try it out! This is an awesome post–please do more favorites like this!!! So helpful! It is definitely expensive, but wow, is it amazing! He has a few different flavors to enjoy and if you like hazlenuts…INCREDIBLE! Have you tried that one, Kath? Great breakdown of the nut butters! Have you tried justin’s maple almond butter? I’ve put a ban on it in my house because I eat it by the jar and they are $10 a pop! Plus, a jar a week is pushing it 🙂 even for me! I love sun butter – need to give that one a try! Do you keep your nut butters in the fridge? I love Justin’s Chocolate Almond and the Squirrel Nut Butters, but they get so hard and flakey in the fridge. My all time favorite peanut butter right now is Santa Cruz, dark roasted, crunchy. It is fabulous! Also, a store near me recently started selling Crazy Richard’s crunchy peanut butter which is also delicious. Teddie Peanut Butter is also great. I tired the sunflower butter…couldn’t do it! It was TOO sweet! I guess I’m just a fan of almond butter, and only almond butter! Btw, I love the one from the Bulk Barn?! I recently discovered Biscoff spread and am obsessed! The only way I’ve eaten it so far is with a spoon, out of the jar 😉 Do you have any suggestions for other ways to incorporate this spread? Melted on anything! Oatmeal, toast, ice cream.. I love it on graham crackers! I love this review. I agree with you on the ones I’ve had… so now I have more to try! Thank you. Just wanted to give you some feedback that I love this post! Thanks for the post, Kath! Could you clarify the difference between palm oil and palm fruit oil? I am obsessed with a few flavors of peanut butter (peanut butter coconut by Earth Balance and PB Cinnamon Swirl by PB & Company) which both include palm FRUIT oil. I hear that palm fruit oil is all natural, high in Vitamin E and non-hydrogenated? You are correct – the palm oil and palm fruit oil are good for you. It’s just the environmental concerns that are bad. The fruit oil comes from the fruit part of the plant – that’s the only difference. isn’t palm oil a saturated fat – maybe not so heart healthy? I like Marantha sunflower seed butter, much better than Sunbutter. I haven’t tried TJ’s. Hi Kath, this post will be really useful for me as I’m getting really into blending my own breakfast smoothies and trying out different combinations of nut butters and seed butters to see which flavor combos are best. I have to give you a little bit of a hard time though, because we all know Biscoff spread has no more right to be on a list titled Top 10 Favorite Nut Butters than a jar of Oreo cookie icing would! Come on girl, that was kind of a random inclusion, but I’ll grant you that Biscoff does have a sneaky way of ending up places it’s not supposed to be. Such as my belly. Now I am craving all kinds of nut buttahhhhh. I have never tried Biscoff. Need to get on that! I ADORE Barney Butter!!! I smother it on my whole grain thick seedy french toast along with banana and a touch of maple syrup! The meltability of barney butter is just out of this world! that naturally nutty stuff is the BOMB. I accidently bought it at a health food store (the vanilla/cinnamon) – meant to buy plain. OMG. it says its very low sugar but it tastes SO SWEET AND AMAZING AND I DIE FHASDJKLFHDASL SO GOOD. Kath thanks to you I finally tried Sunbutter – and I am OBSESSED! Once I get to a Trader Joe’s I must try their brand also. Thanks for opening my eyes! This may have been mentioned already (don’t have time to read all of the lovely comments), but I really like Whole Foods’ brand of crunch almond butter (365 Organic). It has plenty of nuggets of almond in it and no sugar. I literally ate a quarter cup of it on the first night it was so delicious. Thanks for making this post! It’s just what I’ve been hoping for. Hi Jamie, anything roasted sounds great. I’d love to try it. THANK YOU for this post! I have always been curious about your fave nut butters! I enjoy making my own almond butter and sunflower seed butter. Both super easy and super tasty! You really have to check out my post on my all time favorite Almond Butter, Naturalmond Butter at http://www.marla-deen-fit.net/3/category/almond%20butter/1.html. It is the best stuff I’ve put in my mouth! Only two ingredients! Love looking at your favs though! Love this post! I just did one on nut butters on my new website…but I only reviewed 3 🙂 Maranatha is my fav because of the no stir! Also want to say you’re one of the first bloggers I began following 4 years ago and now I’ve finally taken the big leap and started my own, thanks for the inspiration!!! I am such a sucker for a good nut butter. I could eat it on a seedy/grainy slice of bread every day (and I practically do!). I really love the crunchy, unsalted almond butter at Trader Joe’s. It’s my go-to. So glad I found your site! Have you tried whole foods chunky peanut butter and compared it to Trader Joe’s? I noticed WF is a lighter roast and Trader Joe’s taste too roasted almost burnt? By the way, when you get to the end of the nut butter jar and its not so drippy anymore (when its dry and thick) what do you do with it? Any special recipes? Did you ever try the Trader Joe’s Almond Butter w/roasted flaxseed before they yanked it off the shelves in October? It was the BEST nut butter I’ve had in my life. Here’s hoping they’ll bring it back soon. I just bought #5, gave it a big stir, tasted it, and stuck it in the fridge per the label. So , how do you get that drippy appeal you talk about? Mine is solid! I don’t put it in the fridge… Against the recommendation. I will say I just recently had the Whole Foods 365 brand creamy peanut and almond butters and I was blown away by how drippy they were! I thought nothing would surpass Crazy Richard’s in that department. Just stumbled onto your blog recently, I love that you wrote a post completely about nut butter!!! It’s pretty much my favorite thing, maybe ever. I’m definitely adding you to my daily read list! I just found your blog–its great!. I am so glad that Trader Joe’s PB is #1 on your list – I have been buying it for a while now and love it. Regular PB now tastes like frosting to me. I also bought a jar of TJ almond butter recently, and I like that too although its a little drippy. I like to add nut butters to yogurt, oatmeal, toast, mini whole wheat bagels, whole wheat english muffins, etc. I find that it helps fill me up. How often do you have dessert nut butters? I struggle with finding a balance with them. Wow, my comment to this is old news at this point, but thanks for the reviews. I’d rather do my research before I buy and then regret it! Love your blog!